Num Skull, one of the first Midwest thrash bands, was originally formed in 1985. They released their first demo "Nums the Word" in 1987. The following year marked a change to a more extreme and heavier sound as exhibited on the band's second demo "Thrash to the Bone". The new material was much faster and the vocals were far heavier. This new style created quite a buzz in the underground and it soon led to a contract with Enigma Records. 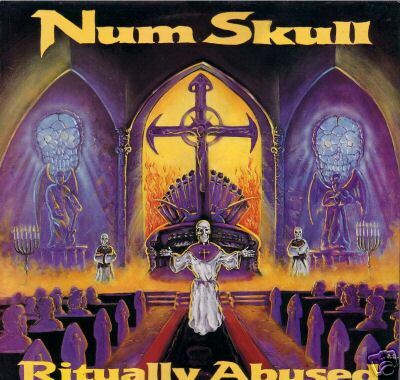 Later in 1988 Num Skull recorded their debut album, "Ritually Abused". The album contains 12 tracks consisting of extremely catchy riffs and dark lyrics. Although well received by the underground the album received virtually no promotion and backing from the label. Problems between the band's management led to the mutual termination with Enigma Records. In early 1991, Num Skull released a 9 song promo tape that featured a heavier, far more brutal sound. The promo tape featured the patented, catchy, heavy guitar riffs along with much improved, heavier vocals. In 1995 Rage Records (N.Y.) released the Num Skull/Sea of Tranquillity Split 7" pressed on blood red vinyl. Also in 1995 Num Skull recorded two tracks for Growing Deaf Entertainment (Holland) that were featured on the compilation C.D. "History of Things to Come". Later that year the 1995 demo was released. It featured the tracks from the compilation C.D. and the 7" along with three newer songs. 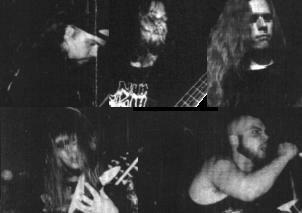 Num Skull returned to the studio in 1996 to record "When Suffering Comes" for Defiled Records (CO.). This is the second full length release from Num Skull but is the first that consists of the following lineup: Paul Benigno - Vocals, Scott Creekmore - Drums and Vocals, Mike Eisenhauer - Bass, David Harrington - Guitar, and founding member Tom Brandner - Guitar. "When Suffering Comes" exhibits the heaviest sound Num Skull has released to date. This C.D. contains nine tracks of pure brutal death metal consisting of such tracks as "Inquisition of the Guilty", "Spill Your Guts", "Force Fed Lies" and a cover of Venom's "Buried Alive". Combined with excellent recording quality Num Skull hope to make this one of the best underground releases of 1997.